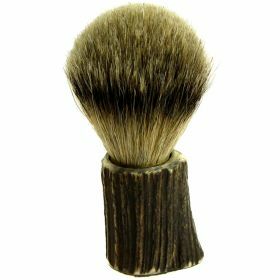 Our magnificent shaving brush includes premium silver tip badger hair bristles and a hand carved stag horn handle (ethically sourced), which gives the brush a traditional and stunning appearance but with a contemporary twist. A solid pewter base is added to the bottom of the handle to complete the design. Elegant and stylish it is presented in a chic cream and black presentation box. Size: L:6.8" x H:4.7" x W:2.1".